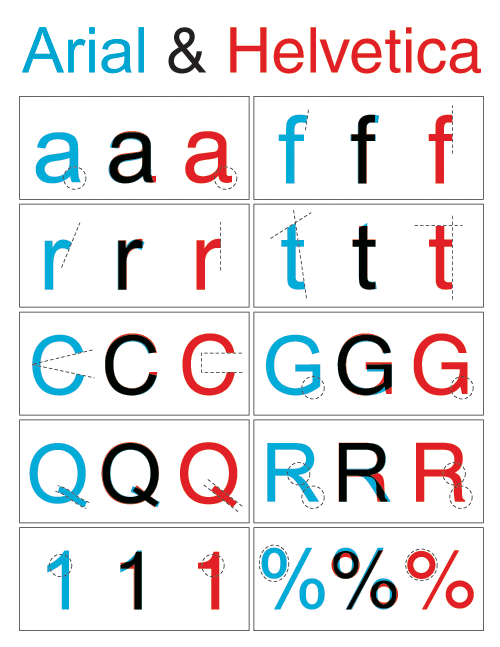 What are the differences between Helvetica and Arial? I've heard there are a number of slight differences between these two similar fonts, is one better than the other for different contexts? As far as the difference goes, you are right. There are some character which are slightly different however the difference goes way beyond just the comparison of the character. I find the differences in uppercase CGQR and lowercase a and t the easiest to spot. And the Arial numeral 1 is gawdawful. *Before people jump down my throat, be aware my tongue is in cheek. You may make a slim case that Arial is better for web design because it is more ubiquitous and has wider support. Otherwise, get outta here. There are certainly more variants of Helvetica. Although the base fonts are very similar indeed, the flexibility of all the Helvetica variants certainly make it a better prospect for design work, especially off-web. Not the answer you're looking for? Browse other questions tagged typefaces or ask your own question. Which of these font communicates “luxury products” better? Will typeface design ever “stop”? What are the different stroke widths (e.g. in a W) in serif fonts called, and why do they have a particular orientation?